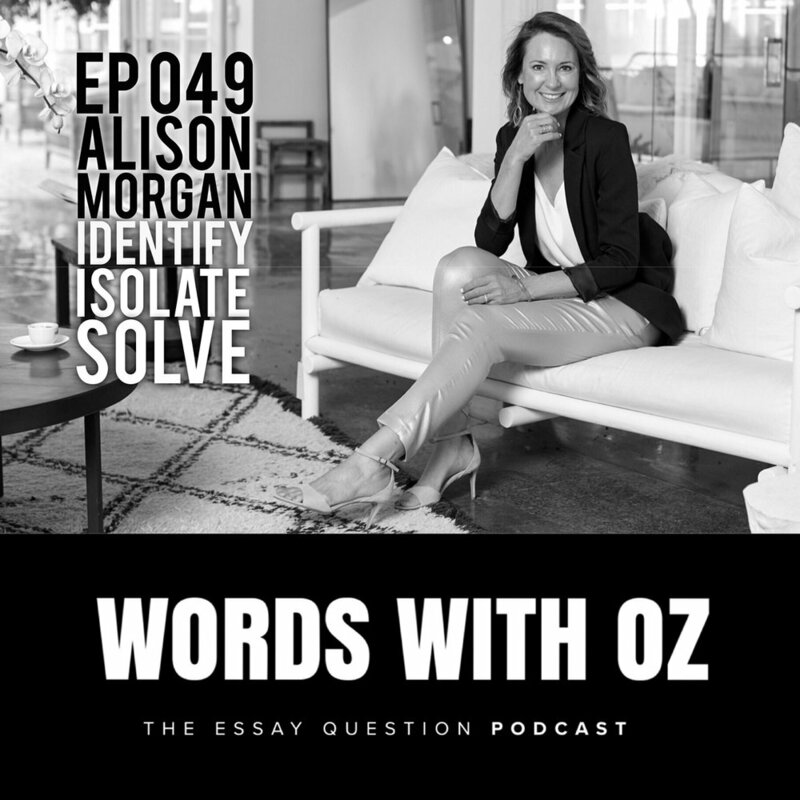 Cass Spies, owner and founder of Twisted Yoghurt joins Oz on the Words With Oz Podcast this week. For many years Twisted Yoghurt battled in the retail market, an after listening to opportunity Cass took the company in a new direction, they transitioned into wholesale. Nine months on the company is now moving with more momentum and more purpose than ever. "Both life and business have many transitions. Careers change, business models become outdated; Do what do you hang your authenticity on when battling these unexpected moments of change?" Listen to an insightful hour of conversation between Oz and Cass as they discuss business' energy, learning to unplug and de-load, and what lessons Cass has learned that she will pass on to her children. 36.18 : 40.22 - What's next for Twisted. 56.47 : 57.14 - Cass' Legacy. 57.15 : 58.14 - Thank You & Wrap Up. This week Oz sits down with entrepreneurial juggernaut Barb de Corti. Just on twenty five years ago Barb introduced Australia to ENJO. In search of a safe cleaning alternative for her household where her son suffered from Asthma, Barb took that passion and this solution; and turned it into a purposeful, powerhouse company that now reaches nationwide. I asked Barb on the show not only because her story is an inspired one but also because of her innate ability to only see the possibilities in the world. Lessons learned during Barb’s journey were not set backs but just necessary stepping stones that would teach her to become the joyful, entertaining and savvy businesswomen she is today. A quarter of a century, 50 plus employees and a company worth over $100million. Did 1994 Barb de Corti know that ENJO would experience this success? And at what point did a business that solved a family’s problem develop a vision and strength of purpose that would withstand decades of failures, competition and growth? We speak about real life education, being true to your word and the importance of participating. Inspiration abounds in this hour of energetic conversation. 02.34 : 03.30 - WWO Intro. 07.16 : 12.09 – get off your arse and participate. 12.10 : 14.29 – Clarity on what you want to do. 16.22 : 18.14 – I was always hustling. 18.15 : 23.49 – I like People. 23.50 : 28.14 – Take Action. Bite the Apple and Chew like hell. 28.15 : 31.32 – Listen first… then sell. 31.33 : 36.56 – Taking advantage of Opportunity. 36.57 : 40.47 – Educating and being educated. 40.48 : 43.25 – Small changes, big results. 43.26 : 49.04 – Barb’s current challenge. 49.05 : 52.43 – Pay Cheque is just as important. 56.45 : 1.01.41 – Prepping for productive days. 1.01.42 : 1.03.07 – I always assume goodwill. 1.03.08 : 1.04.32 – Barb’s Best Decision. 1.04.33 : 1.06.46 – Can Knit. 1.13.20 : 1.14.15 – Thank You and Wrap Up. Jacinta McDonell, business powerhouse and co-founder of Anytime Fitness Australia joins Oz on this week's Words With Oz Podcast. Having been at the pinnacle of Australia's most successful fitness chain, Jacinta's wisdom, thoughts and view on life are ripe for investigating. As you'll hear in this incredible episode... it's not just education in business that Jacinta imparts, her transition toward mindfulness, awareness and impactful living will inspire you to change your view and actions in this world. "Over a decade ago you introduced the country to its number one health chain, and now you have found a new focus in The Human Kind Project and ever popular W1LL Studio. How do you decide it’s ‘time’? What are your drivers to stay true to purpose not product nor profit? And why do we need this done in our generation?" Oz and Jacinta discuss her view on education, the nimble nature of Anytime Fitness, as well the importance of courage & belief. Have a pen and paper ready... this show is full of incredible insights. ADAPTING FROM THE INSIDE OUT. This week on the show we are delighted to sit down with the gentle, smart and energetic Lauren Vickers. Founder of Eco-friendly activewear range PacoLovesLuna, veteran model and frequent volunteer... Lauren's experience in a world many can only speculate about provides an incredible platform for us to talk on subjects such as facing rejection, limiting our self criticism and maintaining real connections. "Longevity and a sustainable approach have seen you not only survive but dominate what is quite possibly the most fickle industry – modelling. What lessons and beliefs have held true over the last twenty years; and will guide your future in sustainable fashion and sustainable health practices?" We spoke about clarity of purpose, learning to adapt on the fly and the importance of an inner understanding of ourselves. 23.20 – Learning from experienced and playing to your talents. 32.31 – A young start, rejection and being herself. 57.24 – Connection and Family. The Europeans. 1.24.02 : 1.25.02 – Thank you and Wrap Up. FUN WITH MATES TO SERIOUS BUSINESS. 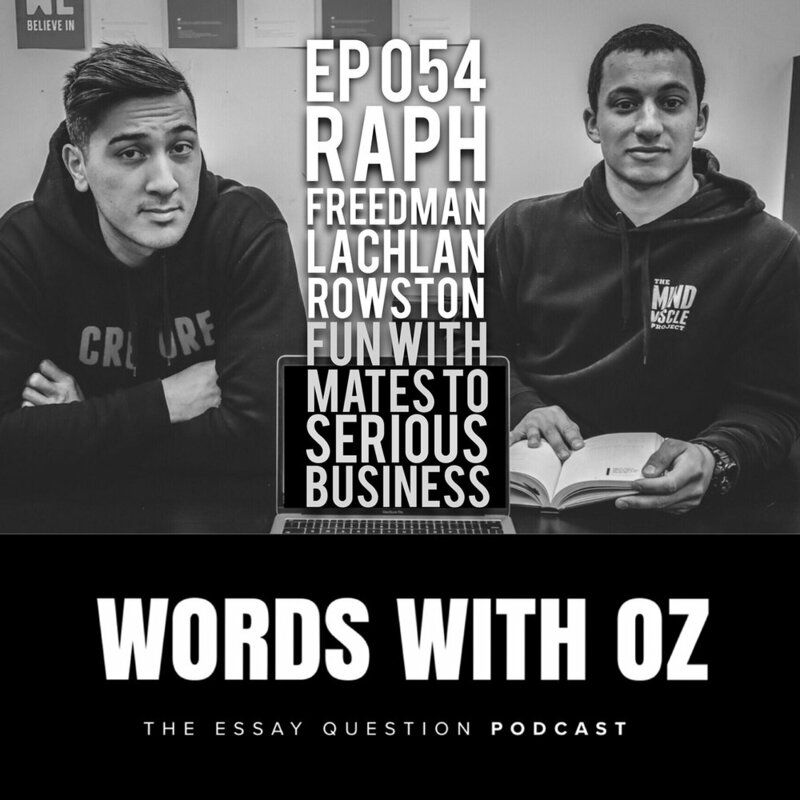 Lachy and Raph from The Mind Muscle Project podcast join Oz on the show this week. Not only are they hosts of the ever popular podcast but they also own or co-own numerous business ventures. Competitors in Crossfit, the duo have experience at regional level both individually and as part of a team. Their minds work in a fascinating way and their focus, determination and will to learn is evident throughout this conversation. "There is an aura of confidence that comes with being young entrepreneurs, successful gym owners and athletes of relative success in the world of crossfit… all well before the age of thirty. Not to mention the popularity of MMP. From your experience and the highly impressive people you have interviewed, what is the most vital component of building confidence?" We discussed business, commitment, self belief and the ongoing challenges of young entrepreneurial life. An entertaining conversation full of insightful lessons to learn. 15.51 : 19.27 - Law Degree? 43.48 : 47.45 - The Belief to Stick To It. 1.05.56 : 1.08.20 - My smartest decision was leaving uni. This week the podcast is privileged to welcome Professor Goran Roos. Goran is a Swedish academic with expertise in a range of fields including intellectual capital and innovation management. Professor Roos was appointed Thinker in Residence for the South Australian Government in 2011 and sits on a number of NFP, private and public boards. He is an accomplished author and educator; and has been named in many ‘influential thinker’ lists. We asked Professor Roos on the show to pry his mind for thoughts regarding early adoption, encouraging entrepreneurship and political regulation. We spoke on the role of morals & ethics, regulation vs. market forces, economic complexity theory and his views on personal growth. Engaging, Educated and one of those episodes you could listen to one hundred times and still learn something new. 23.35 : 27.55 - Not Restrict, Guide. 58.29 : 1.03.44 - What do you Strive for? 1.20.35 : 1.21.02 - Thank You & Wrap Up. Paul Roos has been at the forefront of the leadership and cultural change that has transformed Australian Rules Football for the last two decades, yet, neither are words he would use to describe his techniques. As a Hall of Fame member, 350+ game player and Premiership winning coach; Paul’s credentials speak much louder than he does… and as you’ll hear from this conversation, that’s by design. He believes that it’s not what we say but what people see us do that provides the necessities for ultimate success. His history is littered with leadership by example, a commitment to agreed upon behaviours and trust in the course. Consistency in routine, development of young adults and the surprising basics sportsmen understand that corporate aren’t taught, are but a few of the highly engaging subjects Paul and Oz discuss in this eye opening podcast. 13.23 : 16.33 - Ultimately, we're responsible to take action. 19.58 : 23.46 - The Advantage of Footy Clubs & Sport Clubs. 23.47 : 27.41 - Empathetic Coaching. Empower the Players. 27.42 : 33.22 - Leaders Drive Behaviour. 33.23 : 37.49 - Basic for Sports. Not so basic for Corporations. 37.50 : 41.46 - Developing Young Adults. 41.47 : 47.32 - Challenge or Reward. Act In or Act Out. 47.33 : 49.42 - The Team's Standards ARE The Individual's Standards. 49.43 : 52.54 - Improve Them. Improve You. 52.55 : 57.55 - Solve Your Inner Conflicts with Why. 57.56 : 1.02.45 - The Melbourne Decision. 1.02.46 : 1.05.26 - Inspiring Paul Roos. 1.05.27 : 1.09.43 - The Simple Things Challenge Us All. 1.09.44 : 1.14.21 - My Best Decision. 1.14.22 : 1.15.53 - I never took it too seriously. 1.15.54 : 1.18.29 - School Morning Mantra. 1.18.30 : 1.20.18 - Oz' Take Aways. 1.20.19 : 1.21.16 - A Hall of Famer's Ambition. This week we had the pleasure of sitting down with entrepreneur Bill Kerr. As host of the popular AdventureFit Radio podcast Bill is no stranger to a microphone and the conversation shows. After wading through some mutual admiration and talk about life with dogs... we dive into a few in depth concepts such as the pursuit of happiness, A.I. and the actuality of being a business owner. "The traveling entrepreneur, almost the perfect definition of someone who seeks total control of their life. As a business grows and time becomes more precious, that control slowly fades… How has trusting a virtual team altered the control you have of life and business?" Bill wants to change the world through Travel, Exercise and Mindfulness and it was a pleasure having someone on the show who can deliver his opinion, perspective and outrageous anecdotes all in one. 03.54 : 10.50 - Ziggy, you know Ziggy Stardust. 51.00 : 56.54 - Travel. Exercise. Mindfulness. 1.04.02 : 1.12.07 - My Three Things. The Words With Oz Podcast is fortunate this week to be joined by two of our favourite people and guests. It’s our first podcast with a three-way interview and it does not disappoint. My first two ever guests Chris Feather and Kevin Toonen join me this week for a deep, whole hearted discussion about their personal and team philosophies; as well as the reasoning behind 98 Gym’s new online programme – 98Online. From unexpected clientele To adapting to change; and the importance of integrity through to why and what has gone into this world leading programme. Listen. Learn. Enjoy. 36.27 : 57.59 - A Programme Based on ... Science? 1.24.52 : 1.28.00 - What do I need to know? 1.28.01 : 1.31.30 - Much to be Thankful For. This week on the show we are joined by Anthony Richardson. Owner, founder and brainchild behind Ausfit Torsion Bars, Anthony is a unique example of the entrepreneurial mind. I asked Anthony on the show because of his relentless energy in his pursuit of an idea or venture as well as his drive to solve problems. "Ausfit Torsion Bars – a simple concept in a market place where every gadget is the next big thing – it would have be easy to let the naysayers win and simply give up, but this NSW country boy didn’t give in. 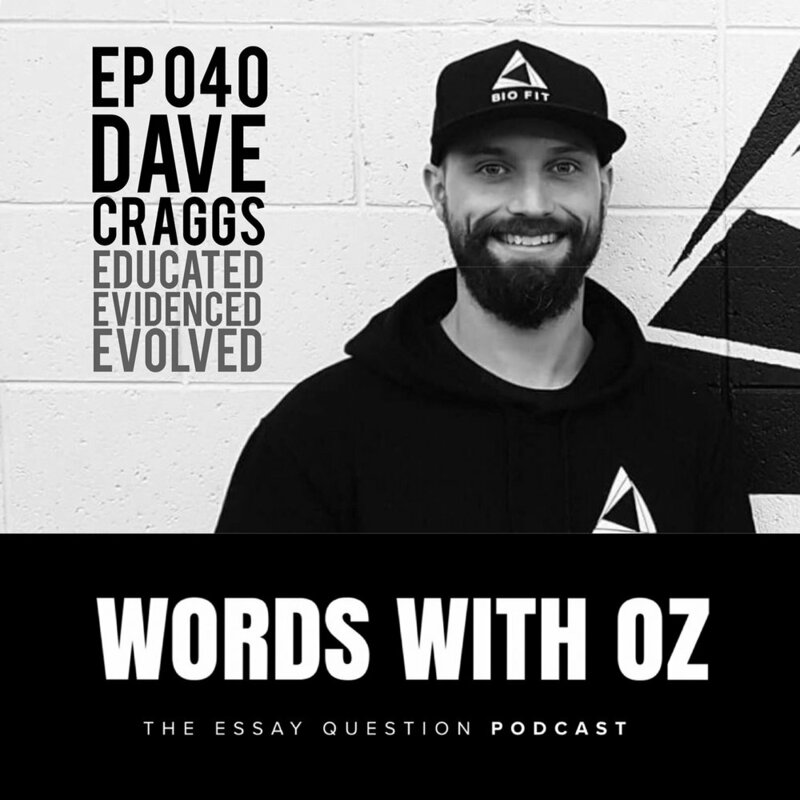 What part does an upbeat attitude and positive energy play in cultivating one of the most successful fitness stories to come out of Australia?" We covered a range of topics from when he had to work several days without sleep to avoid hitting rock bottom, to his first lawn mowing business, through to learning business lessons from family. 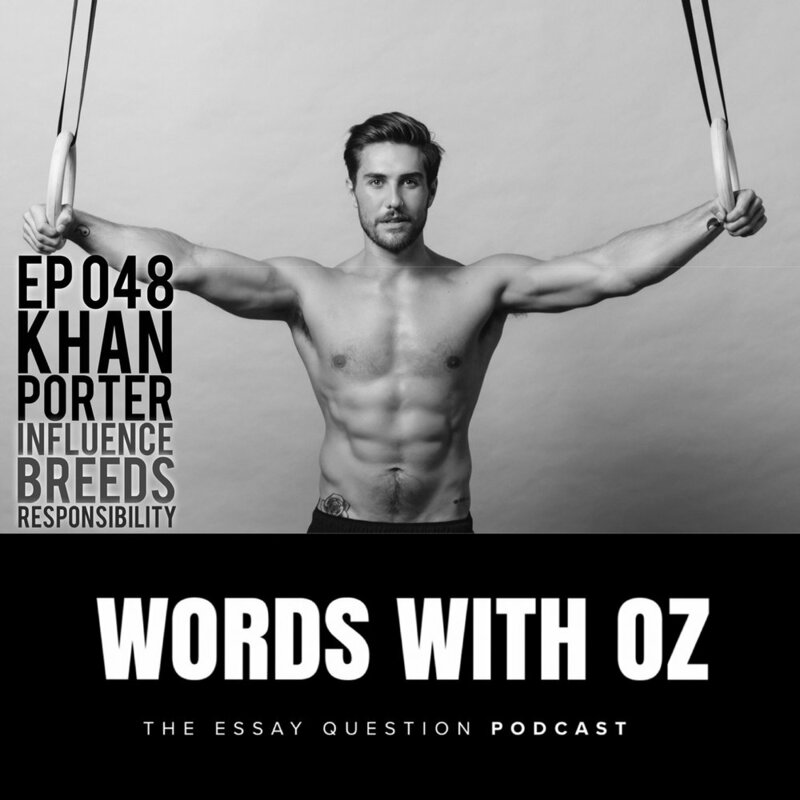 Khan Porter joins Oz on the show this week. A 4x Crossfit Games Athlete, Khan is no stranger to a competitors mindset and our ability as humans to place too large an importance on an outcome. Yet it is something that KP has and continues to overcome. I asked Khan on the show because of the analytical way that he views the world. With an open mind, a desire to learn and constant improvement to his thoughts and abilities - his is a conversation worth sharing. "An elite athletic career that’s seen triumph and anguish, business and education, travel and opportunity… in the search of the intrinsic value of our pursuits, is there anything more important than time?" We spoke about his reasons for heading back to Uni, the underlying philosophy of his training and workshops, as well as how he strives to be the right example for the world. Meaningful, Connected and with an open mind - this was an enjoyable conversation and makes for an incredible podcast. 22.05 : 28.24 - the separation of content creation and being present. Alison is the founder of Relauncher, an online business coaching company helping hundreds of business owners improve their lives and business. I asked Alison on the show because of her ability to connect with her audience, her energetic approach and the plentiful insights she has into what business owners overlook and experience in those early stages. "In all your experience and wisdom as one of Australia’s leading Online Business Coaches, what truth or understanding do people fail to grasp when they begin the process of becoming a Business Owner?" We covered topics from the gap in the events/social media market for men; her beliefs on the smartest places of growth within a business; and her biggest challenges and sacrifices. An entertaining and thought provoking conversation. 11.02 : 12.39 - Integrity to One's brand. 17.12 : 22.54 - Who Coaches a Coach. 41.57 : 43.39 - Know Yourself. 1.04.40 : 1.06.00 - Thank You and Wrap Up. This week Words With Oz hosts a man of many experiences, Geoff Jowett. Geoff is on a mission to make a dent in the world's obesity crisis and he's got a thick resume of experience to help get it done. I'd been following Geoff for some time on social media and have thoroughly been enjoying his message. Geoff's story is one of incredible triumph and unnerving desperation, all of which he now uses to improve the lives of others. From being the head of a $35million+ company to bankruptcy, it's all raw, it's all real and it is all in this podcast. "Dedicating a life to helping others achieve their happiest and healthiest self inevitably faces the minefield that is commercialising a service heavily vested with emotional dependability. What safeguards do you apply to your method that ensure clients results whilst maintaining your own life and level of living?" We spoke of Geoff's ongoing battle with seeking fulfillment while understanding the need for a commercial end, his views on spirituality, as well as just how low he was. This conversation has plenty of insights worthy of anyone looking to be inspired. 12.53 : 15.12 - I Quit. I quit that way of life. 18.53 : 23.22 - Fail. Get Up. Learn. Grow. Change. 1.32.28 : 1.34.04 - Thank You and Wrap Up. We are joined by owner and the creative mind behind Allerton Swim Wear - Pirra Griffiths. Allerton is an independent Aussie Swimwear brand building a global present. Pirra pursues an ethical, environmentally minded manufacturing process and Allerton was founded with a socially conscious purpose. "In an industry perceived to put style over substance; where the allure of margins can lead to questionable morale; what energises you to pursue the business of fashionable swim & active wear with a socially conscious purpose?" Pirra opens up about the incredibly rewarding experience creating something from nothing is, her values system for business and personally, as well as her new venture collaborating with other labels. We can all learn from Pirra's beilefs, philosophy and standards. Enjoy the Show. 23.59 : 24.57 - Earn the Respect. This week on the show we have the privilege on sitting down with Phil Allison: founder, owner and coaching exrtaordinaire at Corporate Edge. 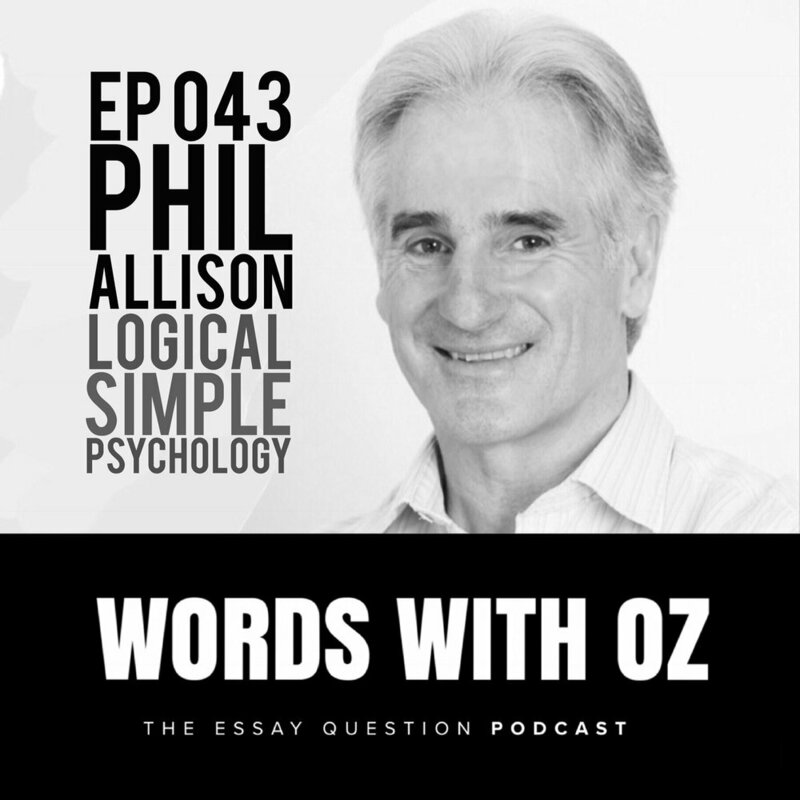 Phil began his own company to inspire people to live their passionate purpose before most had even heard the two words in the same sentence and we asked Phil on the show to share the learnings of his decades of experience changing peoples' lives. "Twenty years of a passionate purpose. From coaching companies in culture, teaching the elite to be better, and turning a love to help others into a thriving business… Was it worth the leap"
We spoke of his daily routines, the nurture of behavioural change and how he equates health to energy. This was a conversation that all should hear, particularly those looking to influence the world to be a more passionate, value driven and inspired place. 1.00.35 : 1.04.09 - Worth It. FEEDBACK IS CRUCIAL, NOT PERSONAL. Josh Gibson is a 225-game veteran of the AFL (Australian Football League), triple premiership player, All-Australian (2015) and key defender for the Hawks during 2010-2017 – the team often referred to as the best of the century. I was fortunate to have Josh on the show to find out what it was about that team, those men and that period of time that made them such a stand out. We spoke about his life after football and the ongoing business ventures he works on; the turning point in hi adolescence that made him realise talent was not enough; his view on the importance of feedback; as well as many other inspiring topics. 1.09.20 : 1.10.20 - Thank You and Wrap Up. This week on the show I am delighted to sit down with the beautiful, energetic and forward thinker Alicia Curtis. Alicia is a business owner, heavily involved in non-for-profit organisations and finalist in this year’s Western Australian of the Year Business Award. I asked Alicia on the show to discuss her perspective of developing young leaders and more particularly, inspiring a rise in diverse youth filled boardrooms. We spoke about her beginnings in the business world and why she ignored the naysayers to pursue what felt right to her. Alicia offers a well thought out perspective that people should be cautious to purely follow their ‘passion’, as it is as (if not more) important to pursue character strengths in combination with what brings fulfillment. A thoroughly enjoyable conversation with plenty to be taught. This week I am joined by long term friend and good-looking rooster David Craggs. Dave is a coach and owner of fitness studio – BIOFIT. He has a unique, well thought out, scientific approach to training and his logical mind makes for great podcast conversation. I asked Dave on the show because he is one of those people that every time you speak with him you come away smarter and viewing life differently. We covered subjects from the future of fitness in Australia through to failures and why a long term approach to improving life is better. 51.30 : 59.39 – Failures, Lots of Them. 59.40 : 1.02.29 – from Port Noarlunga to the World. 1.17.30 : 1.19.13 – Thank You and Wrap Up. This week Oz sits down with medical doctor, media personality and tech entrepreneur Dr Andrew Rochford. The Doc is a straight talking opinionist on many of today's trending topics and Oz took advantage of that to ask & receive some hard truth talk. Power and the Modern Man. As we come to terms with the evolutionary change in roles men and women play in society, has the time of when it was best to be a man passed? 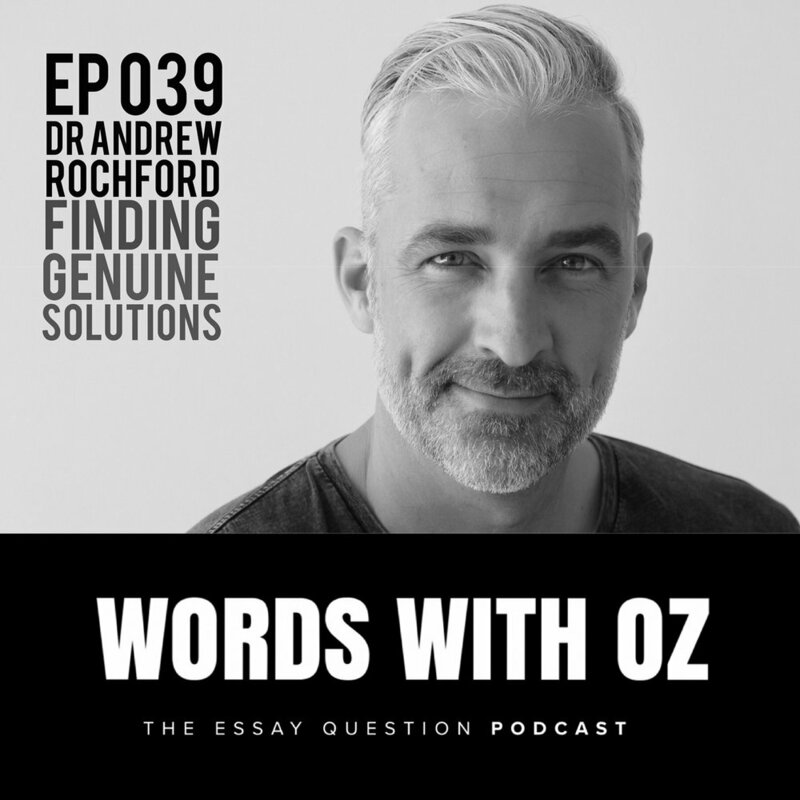 Oz and The Doc discussed the Myth of Perfection, setting the right foundations in our kids (or the doc's kids) to give them the toolkit for a happy and healthy life; as well as his need for problems, solutions and a logical evidence based world. One of the most opinionated and best conversations we've had yet.